SimplyWiFi is a new SIP-based WiFi phone based on Linux that not only lets you make free or low-cost calls, it also lets you IM/chat using the SIMPLE standard. SimplyWiFi is a small lightweight phone with a superb talk time of 10 hours and 250 hours stand-by time. 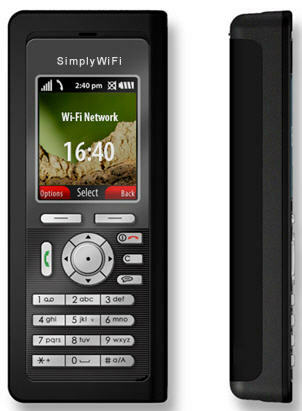 The WiFi SIP phone features a 65,000 color 2.0" TFT-LCD with 176x220 resolution. Wisecom Technologies' SimplyWiFi phone features the ability to make encrypted calls, manage your contacts and send instant messages. The WiFi features include all the usual suspects, including DHCP, authentication and encryption. It supports WEP (64/128-bit), WPA/WPA2 (Personal/PSK/Enterprise), Open System, and Shared Key. I should point out that some SIP WiFi phones only allow you to connect to open hotspots with no encryption. Fortunately, SimplyWiFi has WiFi profiles allowing you to enter in your WiFi security key one time per SSID/WiFi network, save it, and then re-use the profile when you enter range of that WiFi network. \nWisecom Technologies' SimplyWiFi phone features the ability to make encrypted calls, manage your contacts and send instant messages. The WiFi features include all the usual suspects, including DHCP, authentication and encryption. It supports WEP (64/128-bit), WPA/WPA2 (Personal/PSK/Enterprise), Open System, and Shared Key. \nI should point out that some SIP WiFi phones only allow you to connect to open hotspots with no encryption. Fortunately, SimplyWiFi has WiFi profiles allowing you to enter in your WiFi security key one time per SSID/WiFi network, save it, and then re-use the profile when you enter range of that WiFi network.